Disclaimer: Please note that this product is now supplied in 10ml only, though the images above may feature other volumes. 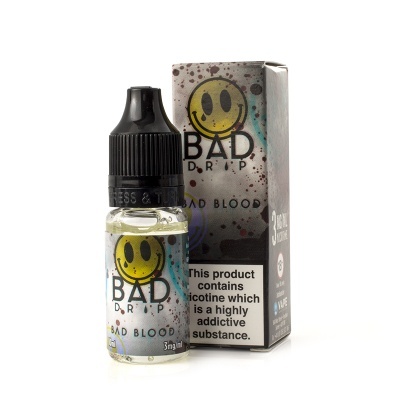 If you're after a rich but fruity taste, then Bad Drip Bad Blood E-Liquid is the one for you! Bad Blood is a mixture of blueberries and pomegranate finished off with a dusting of vanilla to blast you out of this world! Bold flavours and an even bolder design, Bad Drip is a New York company joining the ranks of premium e-liquid manufacturers with their unique tastes. Bad Blood E-Juice is supplied in 10ml bottles, with three different strengths available for your preference. Bad Blood is a fruity combination of blueberries and pomegranate, mixing together sweet and subtle flavours. To add another dimension, a sprinkle of vanilla finalises this blend to take it to a whole new level for your enjoyment. Bad Blood has a combination of 80/20 (VG/PG) for a smooth vaping experience. Bad Blood is supplied in 10ml bottles only.